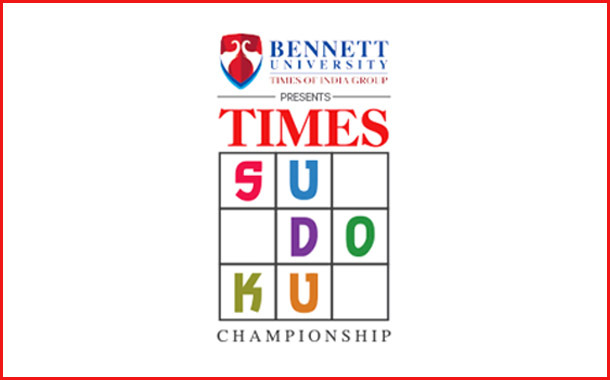 Mumbai: The Times Sudoku Championship, flagship tournament of the Times of India enters its 13th edition this year. As flag-bearers of Sudoku in the country, The Times of India has successfully spearheaded the championship for over a decade. One of India’s longest running Sudoku Championships provides the winners with an opportunity to represent the country at the World Sudoku Championship, which will take place on 4th -11thNovember 2018, in Prague, Czech Republic. The first set of rounds of the Times Sudoku Championship will be held across 5 cities including, Mumbai, Delhi, Bangalore, Kolkata and Chennai over the next few weeks. Winners for the regional rounds will be picked on the basis of their performance during the on-ground event. The city finalists will be brought to Bennett University, Greater Noida for the national finale. The top four talented players will get a once in a lifetime opportunity to represent India at the World Sudoku Championship 2018, to be held in Prague. Sudoku has remained a mainstay in the publication’s leisure pages. In its 13th edition, the property will see an amplified push across the most engaging sections in Bombay Times, Delhi Times, Calcutta Times, Bangalore Times and Chennai Times as well as their digital platforms. The previous editions have seen some skilled minds take their passion and addiction for Sudoku to the next level. The Championship will be an opportunity for ardent players to compete with the best from around the world and win some medals for the country. The registration process is fairly simple and can be done via their website or a SMS to 56161 with the message ‘SUDOKU <space> Full Name <space> City’.